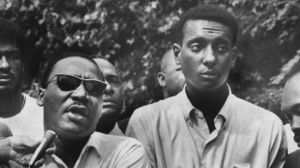 Stokely Carmichael (right) with Martin Luther King Jr.
Stokely Carmichael a.k.a. Kwame Ture was a Trinidadian-American and was a leader of SNCC, the Student Nonviolent Coordinating Committee, and a subsequent leader of the Black Panther Party. H. Rap Brown a.k.a. Hubert Gerold Brown and Jamil Abdullah Al-Amin (born October 4, 1943) succeeded Ture as chairman of the Student Nonviolent Coordinating Committee. Stokely Carmichael changed his name to Kwame Ture in 1978 to honor Kwame Nkrumah and Ahmed Sekou Toure, two African socialist leaders. He died of prostate cancer in November 1998 at age 57. Kwame Ture spoke at IMPACT 1967. "IMPACT committee members chose to tackle largely racial issues of the time with the program of 1967, entitling it, “The Individual in American Society.” Speakers included: journalist Rowland Evans, Dr. Martin Luther King, Jr., (Civil Rights leader, president of Southern Christian Leadership Conference), Hedley Donovan (editor ­in­ chief of Time ­Life, Inc.), Dr. P.K. Banerjee (minister to the U.S. from India), Strom Thurmond (republican senator from South Carolina), Allen Ginsberg (poet), Kwame Ture (head of SNCC), and Dr. Frank A. Rose (president of the University of Alabama). This year’s IMPACT sparked a great deal of controversy as a result of riots at Fisk University and Tennessee A&I (now Tennessee State University). Many blamed Carmichael’s speech and SNCC’s presence in Nashville for the riots, while others believed that the riots were imminent and fueled by excessive police force. Nonetheless, Vanderbilt faced serious criticism for having Carmichael speak, though Chancellor Heard stood behind the decision. The IMPACT committee subsequently upheld the right for students to choose who they wanted to speak at IMPACT, but gave themselves a bit more agency in the process in an effort to prepare for any similar incidents in the future. IMPACT 1967 was certainly a program to remember." Kwame Ture was a contributor to The Black Scholar. In 1968, John Conyers told The Worker, a Communist Party USA publication, that he was organizing a committee of blacks to evaluate candidates for the 1968 election. It was part of his overall program to organize American Negroes into one voting bloc. For his evaluating committee, he had chosen, among others, the revolutionaries Stokely Carmichael, Ralph Abernathy and Floyd B. McKissick. Kwame Ture visited North Vietnam, China and Cuba. He "traveled abroad to several countries, including North Vietnam, China and Cuba. He made perhaps his most provocative statement in Havana. We are preparing groups of urban guerrillas for our defense in the cities, he said. It is going to be a fight to the death. "Mr. Carmichael was arrested so often as a nonviolent volunteer that he lost count after 32. His growing impatience with the tactics of passive resistance was gaining support, and in 1966 he was chosen as chairman of Student Nonviolent Coordinating Committee, replacing John Lewis, a hardworking integrationist who is now a Congressman from Georgia." "Barely a month after his selection, Mr. Carmichael, then just 25, raised the call for black power, thereby signaling a crossroads in the civil rights struggle. Increasingly uncomfortable with Dr. King's resolute nonviolence, he sensed a shift among some younger blacks in the direction of black separatism. Many were listening sympathetically to the urgings of Malcolm X, who had been assassinated a year and a half earlier, that the struggle should be carried out by any means necessary." "In 1966 and 1967 Mr. Carmichael lectured at campuses around the United States and traveled abroad to several countries, including North Vietnam, China and Cuba. He made perhaps his most provocative statement in Havana. We are preparing groups of urban guerrillas for our defense in the cities, he said. It is going to be a fight to the death. "He became a globe-trotting exponent of the All African Peoples Revolutionary Party, returning to American campuses to recruit. He maintained that continued progress for black Americans could be made only through mass political organization on a Pan-African scale. Black power, he said, can only be realized when there exists a unified socialist Africa. He sounded the idea that blacks must work with blacks for their cultural, economic and political liberation. This page was last modified on 27 June 2018, at 01:21.